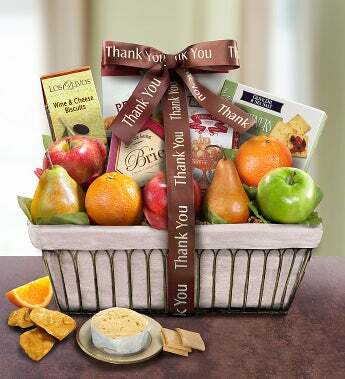 Thank someone for their generosity, kindness and thoughtfulness with this elegant wire thank you gift basket full of the freshest fruit and epicurean snacks. Choose from a selection of Comice and Bosc pears, navel oranges or 2 different types of seasonal apples, fresh from the The Fruit Tree™ orchards. We’ve also included sweet snacks like Old Dominion Peanut Brittle and Petite de Fruits with a delicious pairing of savory Brie Creamy Cheese Spread and Partners Olive Oil & Sea Salt Crackers. Thank someone for their generosity, kindness and thoughtfulness with this elegant wire thank you gift basket full of the freshest fruit and epicurean snacks. Choose from a selection of Comice and Taylor's Gold pears, navel oranges or 2 different types of seasonal apples, fresh from the The Fruit Tree™ orchards. We’ve also included sweet snacks like Old Dominion Peanut Brittle and Petite de Fruits with a delicious pairing of savory Brie Creamy Cheese Spread and Partners Olive Oil & Sea Salt Crackers.